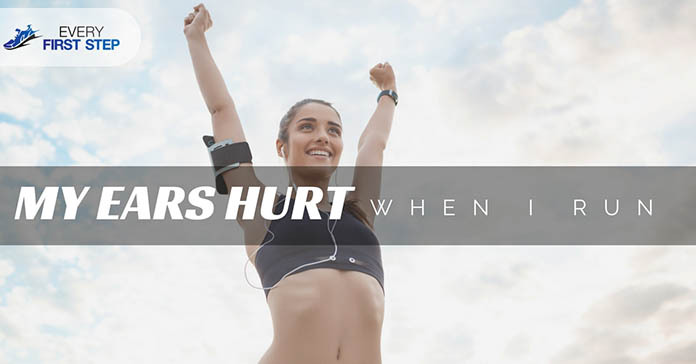 →Why Do My Ears Hurt When I Run? Have you ever experienced pain in your ears when running? If you have, you are not alone. This condition hinders many runners worldwide from achieving their highest performance. Being in such a situation can be discouraging. You may ask yourself- why do my ears hurt when I run? How can I prevent this from happening? If you are one of those people who loves to listen to music when running, this may be the cause of your ear pain. Using earplugs for extended periods of time may cause your ear to become irritated and even painful. When you are running, the earplugs will likely bounce around inside your ear causing the irritation. On the other hand, wearing large earplug may put too much pressure on your ears irritating them. A natural alternative for this is using earplugs that have a curved plastic to create more comfort. The eardrum is what separates the outer and inner ear and is vital for balancing the pressure in the ear and for balance. In some instances, a small perforation in the eardrum may occur. Although this is not caused by running, it may increase the pressure in the ear causing pain. The cause for a ruptured eardrum may be a sudden change in ear pressure, severe head trauma or ear infection. If this happens without your knowledge, it may worsen with running. When your head moves up and down as you run, the circulation of your body increase and more pressure is exerted in your eardrum. Additional side effects of this condition include a change in air pressure and sensitivity to loud sounds. Some may also experience vertigo and﻿﻿﻿﻿ ear discharge. This is one of the most obvious causes of ear pain. Ear infections may be caused by fluid buildup in the ear, allergies, colds or sinus infections among other things. Some of the things that can make one prone to ear infections include the change in climate, altitude, illness and exposure to cigarette smoke. Symptoms of an ear infection include air bubble or fluid inside the ear, fluid draining from the middle ear and a hole in the eardrum. These symptoms can be identified by a physical, so you will need to consult one before identifying if this is the cause for your sensitive ears. GERD is also known as gastroesophageal reflux disease and is a condition where stomach acids flow back into the esophagus. One of the symptoms of GERD is ear pain. If the condition doesn't address, it may cause severe ear infections. During workouts such running, the stomach moves around which may make the condition worse. The dynamic movement like this, symptoms of GERD including ear pain become more pronounced. Running in cold weather may cause the blood vessels to constrict which in turn cause pain in the ear. Running for long distances may also trigger the same result. When blood flow is constricted in the ear, pressure may build up causing ear pain. This is considered one of the most common causes of ear pain. If you know you will be running in cold weather, make sure you dress up appropriately. Wear protective clothing such as a muffs or headbands. Consult the doctor once you feel pain in your ear. This way you will be able to treat any ear infection before it worsens. Use the right kind of earplugs if you want to listen to music when running. Avoid running in the cold or for long distances if you have sensitive ears. This will prevent pressure building up and trigger the pain. ​Take a rest from running if you have a ruptured eardrum or infection. This will allow your ears to heal and prevent further complications. Consult a specialist for proper diagnosis ​if the pain in your ear persists for extended periods of time. To wrap things up, here are some practical steps you can take to try and prevent ear pain when running. The earlier you identify the cause of your pain and address the issue, the faster you will be able to return to your running routine. Aside from experiencing painful ears when you run, you may also experience your teeth hurting when you run. If this happens to you, the cause is probably because of grinding teeth, a tooth infection, sinus infection or temperature sensitivity. Like your ear pain, you would need to follow these preventive measures. These are leading causes of ears hurting when you run. Were you able to identify the cause of your ear pain? We hope this information helped you. Please let us know what you have done about your ear pain. Let us know if you have any questions about this topic; we’d love to help.